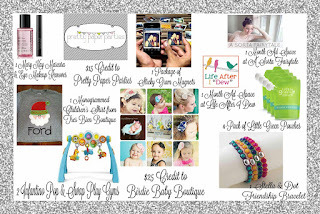 Today I am linking up with Beach Bum and Baby and talking about Stocking Stuffers for those little munchkins in your life. Those cute little toddlers that love us so much. Here is an idea of what C's stocking will be filled with this year. Curious George, Mickey Mouse or Play Doh. So Santa for the win!! I know my sweet face will be so excited to open all of us Santa pressies. What are you stuffing in your toddlers stocking this year? 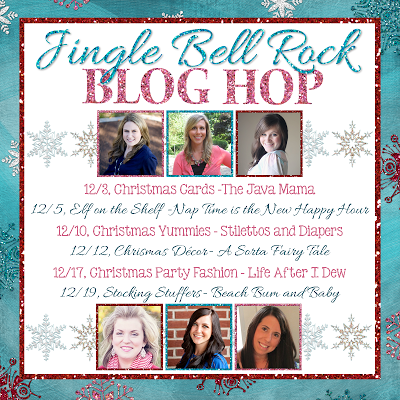 Today is the last day of the Jingle Bell Rock Blog Hop. and wanted to thank you for linking up with us all. The winner big giveaway winner will be announced tomorrow. So here is one last change to get your entries in. Great stocking stuffer ideas! Toothbrushes are great for kids of nay age. My girls are older and love lip balm and lotions. Slinkies are always a hit too and specialty chocolates and sweets that only come out at Christmas. Toddlers are so hard! I got books, bath toys and drinkable foods, too.